As I sat in my folding chair at the 2011 Fathers’ Day car show in Wendover, Nevada, I watched several of the other participants buzzing around the parking lot in golf carts, Jazzy scooters, and a motorized cooler. It was then that it hit me. Let’s put a golf cart drivetrain in the midget and bring it to car shows! 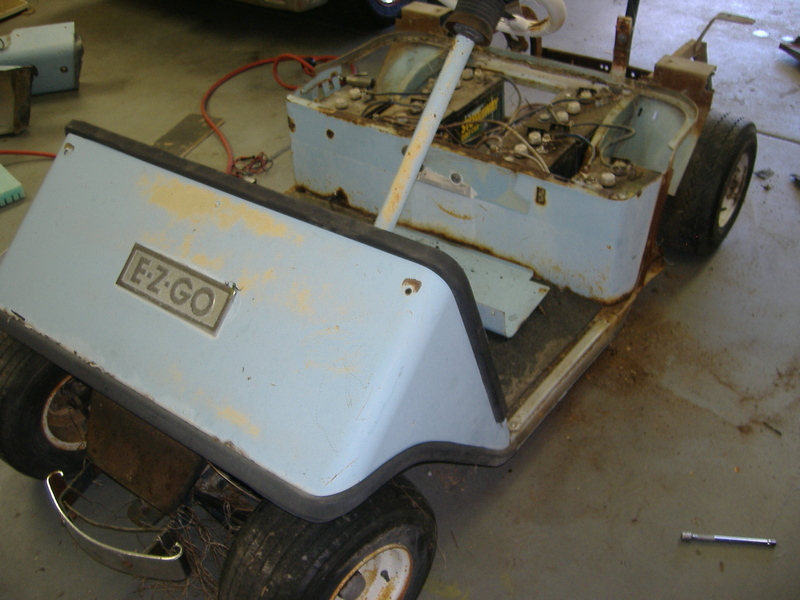 My dad had been keeping an older E-Z-GO golf cart in his back yard for several years. He had parked it when the batteries died, not wanting to spend the money on new ones. He told me I could have it. So, with the help of my friend Sam, I dragged it up on a trailer and brought it home. Then, the harvesting began. First, we removed the body. As you can see, the golf cart was no spring chicken. It was a 1979 model, and it had lived a good life. 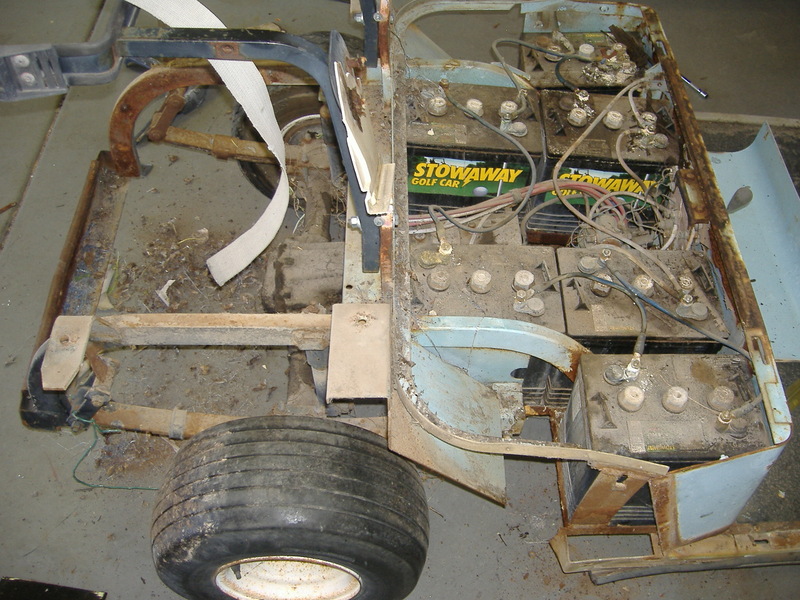 In the above photo, you can see a few details, like the direct-mount motor/rear diff arrangement, the resistor coil set left of the motor, and the six six-volt batteries. Between the batteries, you can see the forward/reverse switch. A nice mix of wires, weeds, dirt and rust. After making a careful drawing of the wiring, we removed the batteries, forward and reverse control, key switch, and accelerator assembly. 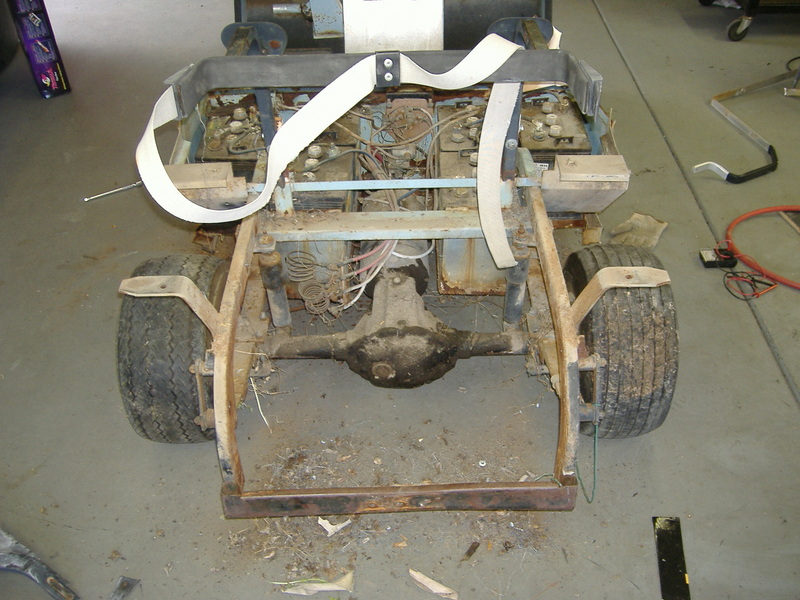 then, we flipped it up on its side to get a better look at the front suspension and steering. Not knowing what would prove useful, we removed everything we could. 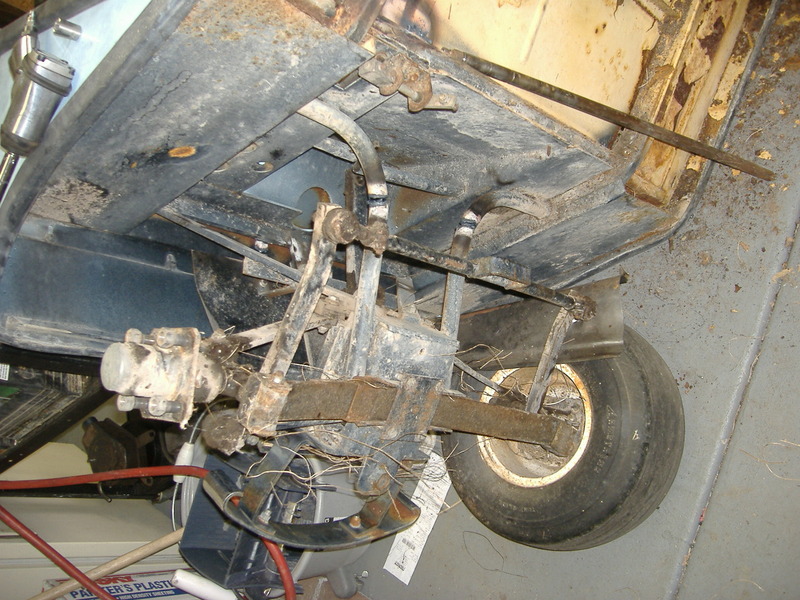 The front suspension/steering was stubborn, but we were able to win out with the help of a sawzall and a torch. This thing was very well mounted. Success! Take that, golf cart. 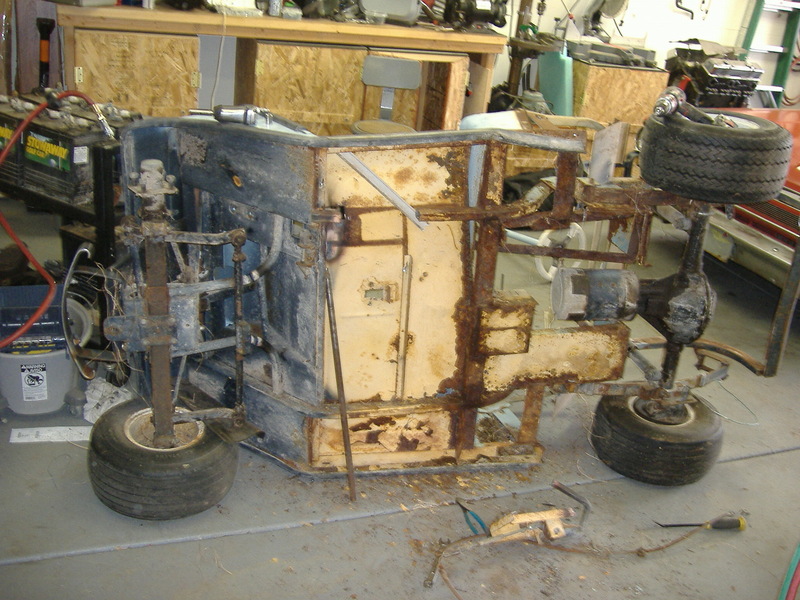 The final step was to remove the rear differential and springs (and the E-Z-GO emblem) and haul the carcass away. I was able to recover $12 for the remaining steel from the recyclers. To that point, I was ahead on this deal. Some time later, I asked dad where he had gotten the golf cart. Turns out, it used to be grandpa’s. 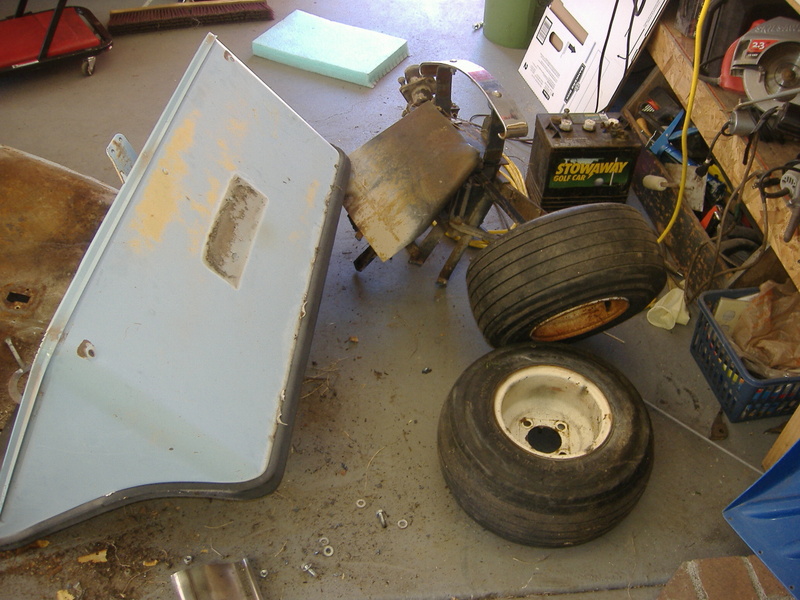 This entry was posted in EV Midget Build, Items of Interest (Not for sale), Race cars, Uncategorized. Bookmark the permalink. Freakin’ awesome. When are you going to let me do a lap around the block? The midget is for all to enjoy. Any time you think you are man enough, just stop by.